During Hanukkah, we have eight days filled with beautiful light. To prepare for this holiday, the third grade classes explored the power of external light as well as the power of internal light - the light within themselves. This idea came from a session I attended this past summer during the NewCAJE Conference for Jewish Educators at the University of Hartford, thanks to the Peter J. Herzberg Memorial Grant Fund. 1) Light vs. Dark – Students wrote about how they feel in the light and dark, and they recorded their answers on black and white sheets of paper or on the Smartboard. 2) We choose a couple of biblical texts from the creation story and the plague of darkness that mention lightness and darkness. The students were given the verses in both Hebrew and English and had to highlight the words in both languages that referred to light and dark. We also discussed the debate between the House of Hillel and the House of Shammai regarding how the Hanukiah should be lit (start with one candle and build up to eight or the opposite). 4) Following the STEM project which focused on external light, we had a discussion about internal light, highlighting that “our talents, interests, unique qualities, and kind characteristics are our own inner lights.” The students wrote down on an illustrated handout what makes them unique and what interests and talents they have. Students thought about their “inner light” and wrote several sentences in Hebrew on the colorful handout. 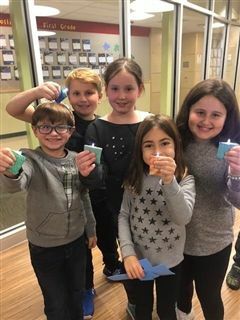 Later on they became part of a large hanukkiah that is currently on display outside the third grade Judaics classes..
5) Finally, with the lights off, the students read each others’ papers using their pocket flashlights. I’m extremely grateful to have had the opportunity to attend the NewCAJE Conference and bring such a dynamic program back to our school and share it with my colleagues as well.